Leonardo was inspired by the sling, an ancient weapon that allowed stone projectiles to be hurled forcefully. This machine was equipped with eight slings positioned at the end of each arm, which could hurl stones in any direction. The idea was to build an economical defensive weapon with easily available materials and without the complications of firearms. The machine was designed to be built with wood and ropes, while the use of metal was limited to the pins and joint elements. The engine was made of a system of enormous wooden crossbows. 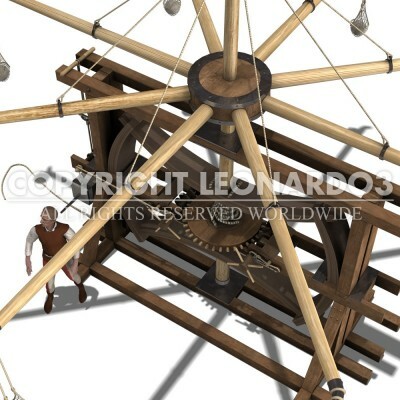 The crossbows were loaded by twisting the cables on the axle upon which the rotating arms were mounted using a toothed wheel turned by two or four people. 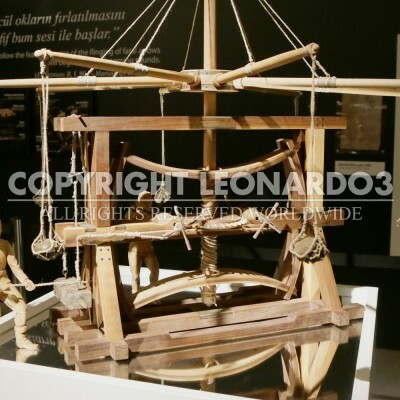 Given the highly dangerous nature of the mechanism, Leonardo studied a release system to securely activate the machine from far away.